The Gentleman Crafter: Questions Answered and a Tim Tag! Well, another day goes by and I'm still writing tutorials! Good Lord Have Mercy on my soul!! I don't even want to talk about it! Catch up is pure hell on wheels folks! 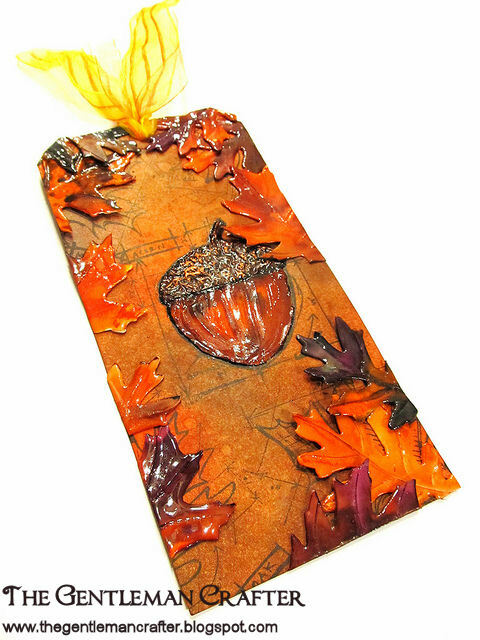 I took some time out tonight to do a video on the the Fall Tim Holtz Tag I had done this weekend. I recreated it to show you how it was done. For the love of God, it's still downloading on my so zippy and speedy country connection to the internet! LOL! It's gotten to the point where I want to sell my house just to move into an area that has real INTERNET! OK, I'm calm and like I said I'm not going to talk about it! Blasted Blue Cheese! Thank you for emailing me and noticing my background. I was needing something lighter and different. I liked the Fall leaves but I was over them. LOL! So up with the lighter and brighter vintage paper. So, thank you all for commenting on that. Next, from my phone blog this morning. I was at work...hence the phone blogging! Bahahaha! At Home? In my dreams...LOL! This week at work has been unbelievable and continues to be. I was trying out the phone software just in case I should need to check into a hotel to be closer to my job! :) Who am I kidding, in case I needed to set up a cot and just spend the night at work! No, honestly, from the phone blog this morning, I shared a picture of my back table where I keep my cutters and a few of my Martha punches. You all had asked where the shelves came from that I keep my punches on....Michaels Craft Store. Here's a link. Thanks You Gang! I hope you like the tag and try it out! Cool Tag. I know how much you love fall. It is my favorite season too! I still want to wander out to your studio to see if i can get any better ideas for storing my stuff! I never seem to have enough room either. And my place is probably 1/8 the size of your place! I have my punches on Ikea bygel rods. Oh, and I also want to learn to use the spackle!! We have to make a date soon! Can't wait to see more tags. This tag rocketh and rolleth!!! That acorn is AMAZING!!! So-the Liquitex molding paste is glossy when dry? Great fun watching you do the tag, Jim! I notice you did clean up that spot where you colored outta the lines--did you scrape it off? Wet it and wipe it and add more color? Do it over? No Nan, not glossy but matte. When you add the inks it makes it look glossy. But when you add the UTEE in Part 2 it will be glossy. About the spot where the Modeling Paste went out of the lines...Yes, just inked over it with one of the Distress inks and it covered nicely. love this tag....just makes you want to jump in a pile of leaves!!!! Happy Fall, y'all!!! Part 2 had problems loading last night! I got up and looked! Blast! LOL! So I reloaded it and it should be up soon on YouTube. Cool tag! Love the technique. Thanks for the tutorial. I love that you used the modeling paste on the stamped image. The tag is beautiful. Loved part one and cannot wait for part two to load. Whilst I was on you tube I watched the video of you and you Mumma crafting. How wonderful that must have been and she is just way too cute. Loved how she kept calling you Jimmy. Gorgeous tag! I'll definitely try the modeling paste. I once tried something similar with ready made spackle and it sucked up the color from the distress inks... guessing because the spackle is water based. It gave a nice look in the end, but not what I had intended. lol Live and learn. Thanks for sharing the video with your technique!! well, just had to come back and say I watch part 2 and to say thanks for it too. Great idea to add utee to the top of the acorn! I had to laugh when you said you were going to learn how to speed it up on the video cause I just sat there mesmerized and watched the whole thing too... as opposed to FFWing through the video by sliding the bar past it... LOL... we all know what melting utee looks like but it is still captivating to watch the transformation! Don't work too hard at work... the weekend is almost here! Jim, You just crack me up. You are so southern and I love it because I'm a southerner too. I haven't heard anyone say, " Good Lord have Mercy on my Soul" in a while. I have a friend who also lived in the country in Texas not too very far from you. He had the same complaint about the internet. He moved to Killeen & is so happy with his new internet. Your tag is wonderful. Thanks for the inspiration! Thank you for answering the questions, Jim...the tag is gorgeous! A bit like the background you had on here! Oh, I love, love it, love it!!! Will have to give it a try. Thanks for sharing. Great tag!!! Love how you used the modeling paste over the stamp...fussy work but well worth the extra time. BTW...any time you need to upload videos with "real" internet...come on over! Yes...you can even do it late at night...LOL!!! Your tag came out so cool. Love the technique of using the modeling paste. Fab! Great tag. I'm making Christmas tags right now and I think I'm going to use the modeling paste to make wreaths and flowers. Thanks for the tutorial. Can't wait to see the second half. Can you find the modeling paste at Michaels or Hobby Lobby? If so, in what department? Jim, as everyone has told you...the tag is fab! I am always looking for a new technique to add another layer of dimension to my project. Is the modeling paste the only product that would allow you to achieve this effect? 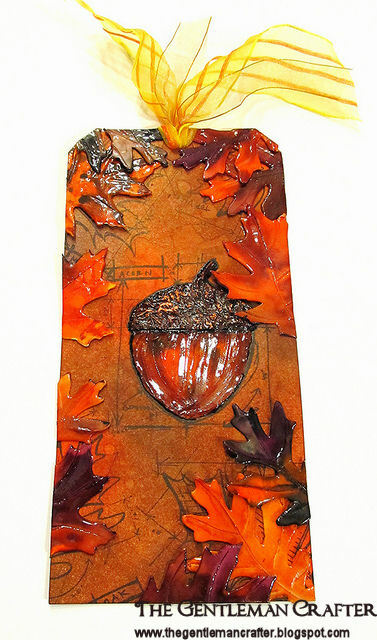 Do you think layering of Mod Podge would work in this application? I can't wait to see the next part of the video! Thank you so much for your generous sharing of your creative genius! Delightful tag! Thanks for the video, always appreciated.